Last night driving home I was listening to NPR’s Fresh Air review of Paul Schrader’s First Reformer, in which Justin Chang tries to align Schrader’s deep knowledge of Christianity with the director’s philosophical and political interests, noting how the two collide for a compelling narrative that turns theological ideas into a psychological thriller. Romanian writer/director Cristian Mungiu (4 Months, 3 Weeks, and 2 Days) walks a similar tightrope in his 2012 drama Beyond the Hills, though from the look of it, keeps any personal doubts about religion much closer to his vest. 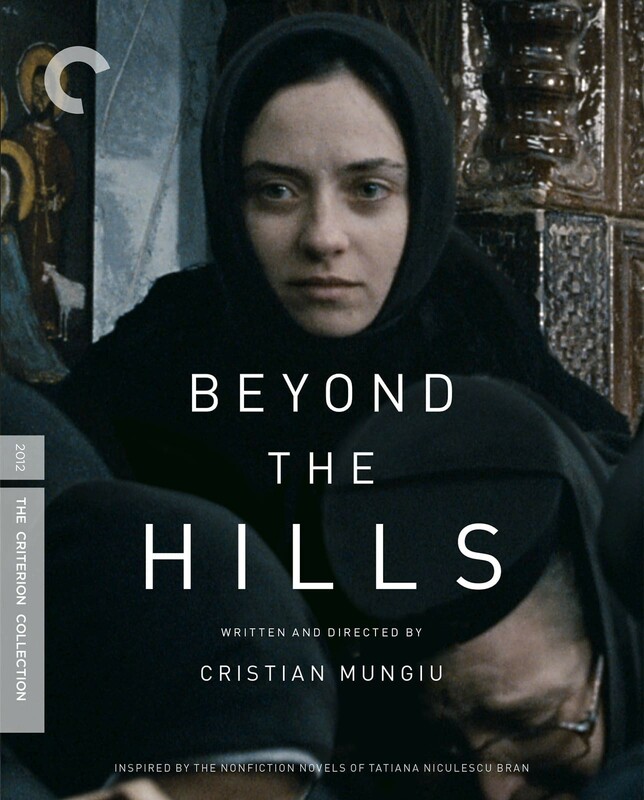 In Beyond the Hills, we can interpret that certain characters have a less than favorable opinion of the church, but for the most part, Mungiu’s script is populated with believers. It’s maybe just a question of how much they believe. 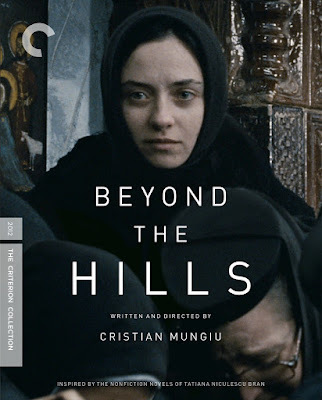 Beyond the Hills is set in a remote Orthodox monastery in the mountains of Romania. Though a bit of a drive from the nearest township, the church still serves the community, both through the worship services they hold and the charity work they do. The monastery itself is run by a priest that the nuns call Papa, or more formally Father (played by Valeriu Andriutä), a man of unwavering conviction. Running the place with him is the Mother Superior, or Mama (Dana Tapalagä), a middle-aged woman. The rest of the nuns are younger, of varying ages and background. One, Voichita (Cosmina Stratan), joined the faith after she outgrew the orphanage where she spent most of her young life. At the orphanage, Voichita befriended Alina (Cristina Flutur), and the two looked out for one another. At the start of Beyond the Hills, Alina is returning home from Germany with the intent of taking Voichita from the monastery and going back to Germany, where they will take a job as waitresses on a cruise ship. When Voichita waivers in her resolve, Alina becomes adamant. As resistance builds, the young woman has a mental break, threatening self-harm and violence against everyone else, before succumbing to a seizure. Unsure what to do, the nuns take Alina to the hospital; the doctors prescribe rest and medication. Now Alina insists on staying at the monastery and near Voichita, but as her behavior becomes more erratic, Papa and Mother Superior begin to question whether she is mentally ill or possessed by an evil spirit. It’s a question that is not really put to the test, even as the priest tries to perform an exorcism on Alina. He and his charges believe the devil is working through the girl; those who will later find out what happened think another way. Mungiu offers no evidence to support either claim. We aren’t even privy to what Voichita believes in the end, even though the traumatic ordeal is transformative for her. In some ways, who we side with as the viewer is up to our own beliefs. The only real takeaway is that, at some point, no matter how strong the faith, all humans come crashing down to earth, and our actions here have true consequences. To go too much deeper into the film’s final turns would be to give too much away. Beyond the Hills is unpredictable in its naturalism and honesty. Best to go in as an open and willing co-conspirator and let the events unfold. Mungiu leaves a lot of holes for us to fill in. For instance, is there more to Alina and Voichita’s relationship than they are willing to share with Voichita’s peers? There’s much to suggest that they could have perhaps been lovers. But then, maybe not. Their bond could be just as deep without that being a factor. Because there is also something childish about how they interact, as if they have not yet fully grown up. The key to all this, though, is the utter realism Mungiu imbues into the product. The natural settings and costuming, lit to look as they would in real life, reflect a world that is separate to that around it. For a good portion of the picture, until we see the first cell phone, the timeframe is not really identifiable. The sparse life at the monastery is purposely without convenience, and so it feels antiquated. Oleg Mutu’s on-the-ground photography places the viewer smack dab in the middle of the action, moving with the drama in the immediate, sometimes even feeling a step behind what’s happening and trying to catch up. Effectively, this makes each viewer as much of a participant as an observer. It feels that close. Likewise, the performances of Beyond the Hills’ ensemble feel spontaneous and of the moment. Many of the cast members are first-timers, but their acting is pitch perfect and completely devoid of mannerism. Much more is often said through how they observe one another than via dialogue (acting is listening!). From the first scenes, we feel we know these people--Voichita’s nervous longing, Alina’s insistent need, Papa’s hubristic privilege. We fear for them and root against him. Then again, that could just be my own prejudice regarding religious authority. For me, the lynchpin is Alina. Even if we don’t logically understand her reactions, our empathy for her plight means we grasp them emotionally. Here Mungiu uses our position as intimate outsiders wisely. We can only see so much. The chaos of her attacks and the retaliation against her--where Alina tends to get buried under the nuns in their black robes piling on--means we never get a clear view of the violence, yet we somehow feel wronged, we feel suffocated. Our interpretative gauge has the reactionary clergy on one side, and Voichita’s deep concern on the other, and we can’t quite get the balance required. It’s like Voichita is the heroine of a horror movie, and we need her fright in order to calibrate our own. Thus, the sudden shift to reality that comes in the final portion of the movie, the arrival of the narrative wake-up call, is both disarming and cathartic. We must be pulled out of this confusion before we succumb to it ourselves. Beyond the Hills is a deeply satisfying drama, right down to the perfect last shot--our own fall to earth, or more accurately the earth rising up to meet us, with only a screen to deflect the dirt.